jamie lewis hadley, We Will Outlive the Blood You Bleed (2014). SPILL Festival of Performance 2014 Ipswich. Photograph by Guido Mencari. Courtesy the artist. British artist jamie lewis hadley has been working predominantly in live performance. His current practise utilises his career as a former professional wrestler and uses it as a departure point to create live art performances that explore, both aesthetically and thematically: blood, deterioration, endurance, pain and violence. He attempts to subvert the use of objects, transforming their original uses (from both wrestling and daily) into images that are affective, challenging and beautiful. His current area of research and creative output is concerned with performing medicine and the history of bloodletting as a medical practice. At the VENICE INTERNATIONAL PERFORMANCE ART WEEK 2016, jamie lewis hadley presents the live performance We Will Outlive the Blood You Bleed (2014): Not everybody bleeds in the same way, but every-body bleeds. 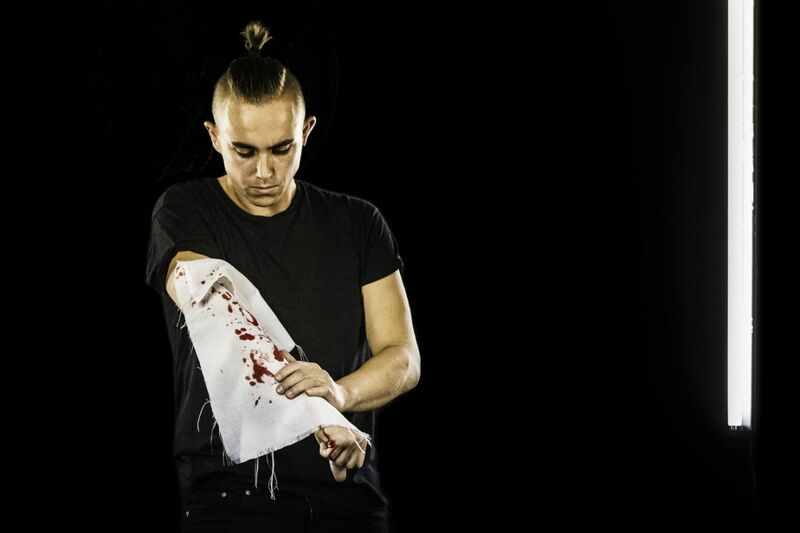 With the constant emphasis on conflicts and discourses surrounding nationality, land, religion and politics in our every day lives, this performance attempts to by-pass these markers of identity and highlight our bodies universality; utilizing blood as a connective and emotive substance.